There is no need to learn what the notes are, or to memorise the keys on a piano or frets on a guitar. Instead simply download our little app, then click on the lines and gaps on the screen - its that easy. This app is not designed to teach piano, or keyboard, but it will let you play some tunes from any sheet music or music books you have hanging around. You can also find plenty of free sheet music on the internet using your favourite browser. Christmas carols are a very good place to start since the tunes are instantly recognisably and usually easy to play. Our Sheet music app will allow you to play single notes, or multiple notes using more fingers. There is also a button to allow you to play chords instead if you want a fuller more rounded sound. You can also play sharps, flats and natural notes as well as higher and lower octaves. This app does not teach you how to read music, or even learn to play the keyboard. 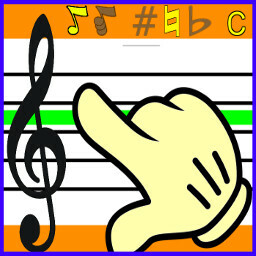 Instead it lets you play music by tapping notes directly onto the sheet music, its easy and fun. Actually you will learn lots on the way, and it may even give you the grounding and confidence to move onto a keyboard, guitar or other instrument. Making Music should not be hard work, it should be easy and fun - now it is! Download "Play Sheet Music" now.